Der Artikel Paolo Fresu (geb. 1961): Mistico Mediterraneo wurde in den Warenkorb gelegt. Italiens Meistertrompeter und Carla Bley-Mitstreiter Paolo Fresu mit "Mistico Mediterraneo", einem einzigartigen Projekt wie es nur unter Aegide von ECM-Chef Manfred Eicher entstehen kann. Auf "Mistico Mediterraneo" tut Fresu sich mit Daniele di Bonaventura (Bandoneon) und dem korsischen Vokalensemble A Filetta zusammen. Letztere gelten als DAS Gesangsensemble der niemals französischen Insel und heimsten in der Vergangenheit gleich eine ganze Reihe internationaler Preise zwischen Folklore und World ein. "Mistico Mediterraneo" ist ein fast schon programmatischer Albumtitel. Mysteriös schimmernde Vokalpolyphonien aus dem sonnendurchfluteten Mittelmeerraum mischen sich mit traditionellem Bandoneon und dem strahlenden Trompetenton Fresus. Das Album klingt als wäre "Sketches of Spain" mit einem Schuss "Officium" zu "Sketches of Corsica" mutiert. Fans zwischen Miles Davis, Anouar Brahem, Hilliard / Garbarek und Dino Saluzzi inklusive. Sketches of Corsica, the Mediterannean and the wider world abound in this fascinating collaboration between lyrical Italian jazz improvisers Paolo Fresu and Daniele di Bonaventura and vocal ensemble A Filetta. “Mistico Mediteranneo” is the first documentation of an alliance that has been gathering momentum for a few years already; it is also the ECM debut of the Corsican singers. The A Filetta group, is celebrated for its re-casting of Corsican vocal polyphony over the last three decades, and for helping to preserve a unique singing tradition, both secular and sacred, whose roots stretch back to antiquity. The A Filetta singers (“Filetta” translates as “fern” or “bracken”) never lose sight of the tradition, but have kept it alive by taking it to new places, writing compositions for the ensemble and initiating meetings with musicians of other genres. The group is led by Jean-Claude Acquaviva, who was just 13 when A Filetta was founded in 1978. For him, “Mistico Mediterraneo” is a faithful reflection of the trajectory of the group’s music: anchored in tradition but continually reaching out to other musics, “ethnic” and otherwise. 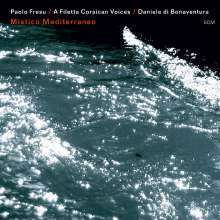 Paolo Fresu, from the neighbouring island of Sardinia, which has its own special vocal tradition, could relate at once to the Corsican music with its “refined and archaic voices”, its mix of contemporary compositions and its attempt to hold fast to “melodies vanishing in the darkness of time”. As the improvisers approach this regional music of universal appeal, Fresu’s pensive, romantic trumpet inevitably brings Milesian associations to mind, and the ingenious bandoneon of Daniele di Bonaventura implies ‘chamber music’ and ‘folk music’ in every breath of the bellows . In October 2006, Fresu and Italian bandoneonist Daniele di Bonaventura, along with two other jazz improvisers (saxophonist André Jaume and percussionist Philippe Biondi ), were invited by stage director Francis Aïqui for a celebratory event in Ajaccio’s L’Aghja theatre, establishing a basis for further collaboration. Over the last four years the musicians have fine-tuned the song cycle now known as “Mistico Mediterraneo”, and di Bonaventura has gone on to work with the singers in other contexts. Jean-Claude Acquaviva is La Filetta principal composer. His “Rex tremendae” and “Figliolu d’ella” derive from a requiem written in 2004, “Di Corsica riposu, requiem pour deux regards”, and first performed inside the Basilique de Saint-Denis outside Paris. “U Sipolcru” is a chant created for a Passion play enacted in Calvi at the beginning of the 1990s. “Liberata” is from a documentary dealing with the Corsican resistance movement during the Second World War. Film has been an important medium for the dissemination of A Filetta’s message, and they have worked extensively with Parisian film composer Bruno Coulais on soundtracks and incidental music of a dozen films and stage works. The chant “Le Lac”, based on a Tibetan mantra, was composed by Coulais for Eric Valli’s film “Himalaya, L’enfance d’un chef”(1999), while “Gloria” and “La folie du cardinal” are from Gabriel Aghion’s movie “Le Libertin” (2000). Three pieces here were written for A Filetta by Jean-Michel Giannelli, composer of contemporary polyphonic chant and occasional on-stage instrumentalist with the ensemble; two of his compositions set texts by Corsican poet Petru Santucci. Paulo Fresu’s recent ECM collaboration with Ralph Towner, “Chiaroscuro” (released in 2009), successful both with the critics and the public, figured in the quarterly list of Preis der deutschen Schallplattenkritik. Since 1990, when he swept the Musica Jazz Polls, the trumpeter has been a multiple award winner. Fresu has appeared on more than 300 albums including leader dates for EMI, RCA and Blue Note. While “Chiraoscuro” was his first ECM release, he can also be heard on the ECM-distributed Watt label, performing with Carla Bley on the album “The Lost Chords Find Paolo Fresu” (recorded 2007). Bandoneonist Daniele di Bonaventura (born in Fermo, Italy) was last heard on ECM on Miroslav Vitous’s “Universal Syncopations II” (also a major prize-winning disc - Preis der deutschen Schallplattenkritik, Jahrespreis 2007). Di Bonaventura has played across a broad field of music – from classical to jazz to tango; he contributes three compositions to “Mistico Mediterraneo”.